Gov. 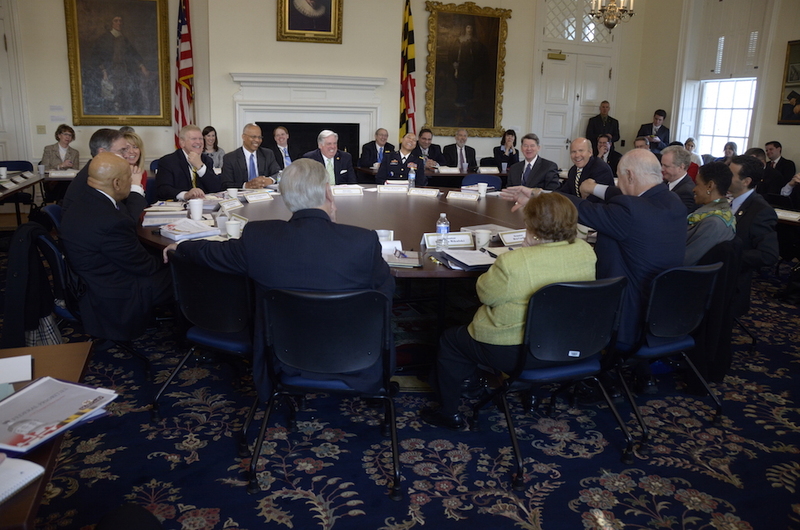 Larry Hogan and cabinet members meet with the members of Maryland's congressional delegation in March. This column is republished with permission from Professor Todd Eberly’s Free Stater blog. In response to Gov. Hogan’s call for redistricting reform, Democratic members of Maryland’s congressional delegation have argued instead for national reform. Reps. Steny Hoyer and Chris Van Hollen have each argued that Democrats in Maryland should not surrender the redistricting power so long as Republicans hold onto the power in other states. So only bilateral disarmament is acceptable. I have advocated national redistricting reform for years. Nothing would please me more or be better for our democracy than national reform. But forgive me for not placing much stock in Maryland Democrats’ new found redistricting faith. Rather I think they are calling for national reform in an effort to provide cover for state Democrats who don’t want to give up the power to pick and choose their voters. Why am I so dismissive? Let’s just say our Democratic delegation sang a different tune when their party controlled Congress AND the White House a few years ago and had the power to enact reform. In 2008 and 2009, a bipartisan group of representatives sponsored legislation to enact nationwide, nonpartisan redistricting reform and called on then Speaker Nancy Pelosi to hold hearings — but it went nowhere. 2008 offered a perfect storm for reform, Under divided government and two years prior to a new Census neither party knew who would be in control of drawing new district lines. That uncertainty would have made reform achievable. But these efforts at bilateral disarmament went nowhere. In fact, as sponsor of the bill legislators were advocating nationwide, bilateral disarmament, Nancy Pelosi joined an effort opposing non-partisan redistricting reform in her home state of California. None of the members of the Maryland delegation co-sponsored or expressed any support for the measure. None. And all of Maryland’s current Democratic incumbents, except for John Delaney, were in Congress at the time. In fact, Steny Hoyer was majority leader at the time. Van Hollen was chairman of the Democratic Congressional Campaign Committee, the fifth-ranking position among House Democrats. Support from either man would’ve guaranteed passage of the bill — but both were silent. Both knew all too well that it was the gerrymandering efforts of Parris Glendening in 2001 that transformed Maryland’s 4 to 4 congressional delegation into a 6 to 2 delegation. Gerrymandering was specifically responsible for Van Hollen’s defeat of liberal Republican Connie Morella in 2002. Why else did Democrats refuse to reform? Because 2006 and 2008 were great years for Democrats. The party regained control of the House and Senate in 2006 and won the White House in 2008. In both elections, the party made gains in state legislatures and governorships. In 2009 talk was of a Democratic realignment and a new coalition of voters that would continue to deliver for Democrats. In short, the party gambled on winning big in 2010 and being in control of redistricting in states across the nation. They saw an opportunity to undo Republican gains made after the 2000 Census and secure a Democratic House majority for a decade. Of course, they lost big on that gamble. In 2010, Republicans made the largest gains in state legislatures by a single party in a century. They used that new power to do what Democrats had planned to do – they gerrymandered the hell out the states they controlled (with especially egregious examples in Pennsylvania, North Carolina, and Texas. Democrats did the same in the few states they controlled (with their own equally egregious examples in Illinois and Maryland). So when you hear a Democratic member of Congress calling for national reform or condemning Republican gerrymandering, do a quick search to see if he or she supported reform in 2009 when their party faced no obstacles to reform. If they were in Congress at the time, and the answer is “No”, then feel free to cast a cynical eye upon them. They had the chance to reform the process, but their commitment to reform lost out to their avarice. Now let me get to the Republicans (of course there’s one Republican in Maryland’s delegation, but his party controls Congress). There is redistricting reform legislation in Congress right now (and 3 of Maryland’s 6 congressional Democrats are co-sponsors). Republicans control the House and Senate and there remains every reason to believe that President Obama would sign a reform bill. The ball is their court now. If they refuse to reform, they easily could find themselves on the losing end of redistricting after the 2020 Census. It’s a perfect time for reform as neither party can predict who will be in charge after 2020. So call on Speaker Boehner, on Steny Hoyer, on Elijah Cummings, on Dutch Ruppersberger, on John Delaney and on Andy Harris to lend their support to the Redistricting Reform Act of 2015. Let’s end this nonsense once and for all. UPDATE Friday, 821, 10 a.m.: Though this article references sponsorship of Zoe Lofgren’s Redistricting Reform Act, which has been reintroduced in every Congress for the last decade, John Sarbanes was a co-sponsor of Rep. John Tanner’s Fairness and Independence in Redistricting Act of 2007. But did not co-sponsor the bill when it was reintroduced in subsequent Congresses. Chris Van Hollen signed on as a co-sponsor of the Fairness and Independence in Redistricting Act of 2009, signing on a year after it was introduced, but did not co-sponsor the bill when it was reintroduced in the following Congress. New fundraising guidelines affecting Maryland’s gubernatorial primary election appear to make it almost impossible for Howard County Executive Ken Ulman, the running mate of Lt. Gov. Anthony Brown, to raise money during the legislative session. The new guidelines appear to show that Elections Administrator Linda Lamone is taking a step back from a highly controversial ruling she made in December, which triggered a lawsuit and was made without the knowledge or consent of her board.